Gastroenterologists tyically use ultrasound or CT scanning in order to resolve and diagnose digestive abnormalities, however, MRI scanning is another option that is sometimes used. MRI scan, or magnetic resonance imaging, uses magnetic waves to create pictures of the inside of the body. An MRI produces both two-dimensional and three-dimensional images, using a large magnet, radio waves, and a computer. Single MRI pictures are referred to as slices which are then stored in a computer or printed on film to create a larger image of the desired organ or area of the body. Most often used by your Arlington gastroenterologist to examine the bile ducts for stones, to diagnose pelvic or perianal inflammatory bowel disease, or to determine what is causes liver masses seen through a traditional CT scan, an MRI scan can be instrumental in evaluating digestive issues. The length of time for an MRI scan will vary, depending upon the area being examined. An MRI can also distinguish tumors from normal tissues, or help your gastroenterologist to learn more about the tumor, such as size, severity, and spread. 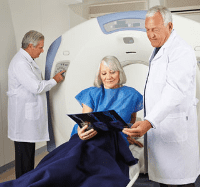 An MRI used an extremely powerful magnet, which means that some patients with certain metallic objects in their body will not be able to undergo the exam. During an MRI scan, an IV contrast may be given to help your technician have a clearer view of the area in question. An MRI scan focuses on a particular part of the body, which means that a portion of your body will be enclosed within the tube of the scanner for the duration of the test. It should be noted that MRI scanner’s can be very noisy, which is normal. Some patients may experience symptoms of claustrophobia during the exam. It is important to inform your Arlington gastroenterologist and MRI technician of any concerns may have leading up to the exam.